Unknown is an action based thriller directed by Jaume Collet-Serra, which is based on the novel Out of My Head by Didier van Cauwelaert. 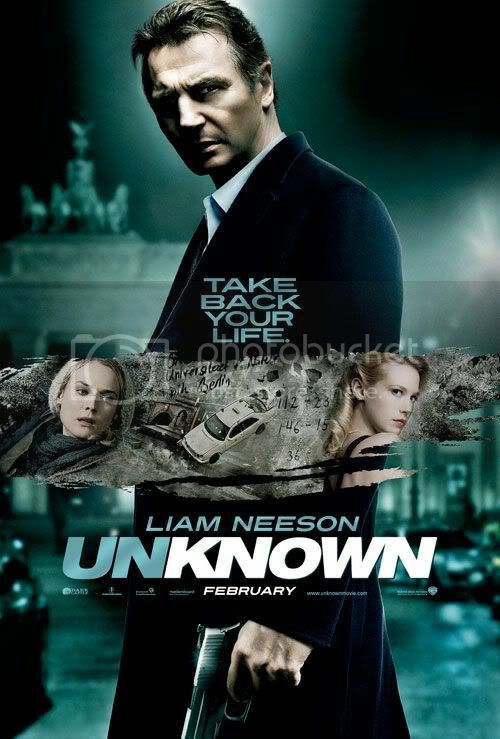 The plot is centered on Dr. Martin Harris (Liam Neeson) who awakens from a coma four days after almost drowning when his taxi plunges into a river in Berlin. He then discovers that his wife (January Jones) suddenly doesn’t recognize him and that another man who he has never met has taken his entire identity. His urges the authorities to help him but they simply find his story far too unbelievable. Now alone and tired in a city he doesn’t know he seeks help from a private investigator (Bruno Ganz) and manages to track down the woman who was driving his taxi (Diane Kruger) hoping she can help him prove his story. But they begin to uncover a deadly conspiracy that will force Martin to question his sanity and his very identity. I wasn’t interested in this movie at first but after seeing the trailer during my past five visits to the cinema and scoring a free ticket I decided to see it. It turns out that my first impression was right. It starts off good, very interesting and mysterious; the plot allows you to speculate what’s happened to this poor man. It actually felt like an episode of the original Twilight Zone series. But once the mystery begins to unravel it’s a pretty big disappointment. I sat there thinking to myself, Oh is that it? That’s not very original. At that point it felt as if there was hardly any point in watching the rest of the movie; it was no longer interesting and I knew what was going to happen. As far as performance go they’re pretty average with a couple of exceptions. Liam Neeson is decent; his performance is nothing special but does a good job with what he has to work with. January Jones is dull and uninteresting as Neeson’s wife, who gives a very lack luster performance. Diane Kruger gives a strong performance as Neeson’s unlikely ally. But the real treat was Bruno Ganz as private investigator Ernst Jürgen, I’ve only seen him in two other films prior to this which were Nosferatu the Vampyre and more recently Der Untergang (Downfall). He’s such a marvellous actor to watch. In spite of the entertaining first half overall this is a very bland film in general with nothing that really stands out, which is a shame. There are action cliques and a story that goes from intriguing to flat out boring and predictable almost in an instant. There isn’t much more that’s worth saying .If you plan on seeing this, wait for the DVD or Blu-ray.